This EKG comes courtesy of Dr. Elias Youssef. A 66 year old Female with a history of hypertension and hyperlipidemia, presented with abdominal pain radiating to the back and left lower extremity. The pain was sudden onset just prior to arrival. The EKG shows ST elevations in leads II, III and aVF as well as V4-V6 with reciprocal depressions in I and aVL as well as R waves and ST depressions in leads V1-V3, suggesting an infero-postero-lateral STEMI. The patient’s symptoms were concerning for an aortic dissection which was confirmed on U/S and CT. The patient was taken to the OR. The EKG shows ST elevations in leads II, III and aVF which suggests an inferior wall MI. There are also ST elevations in leads V4-V6 suggesting lateral wall involvement as well. 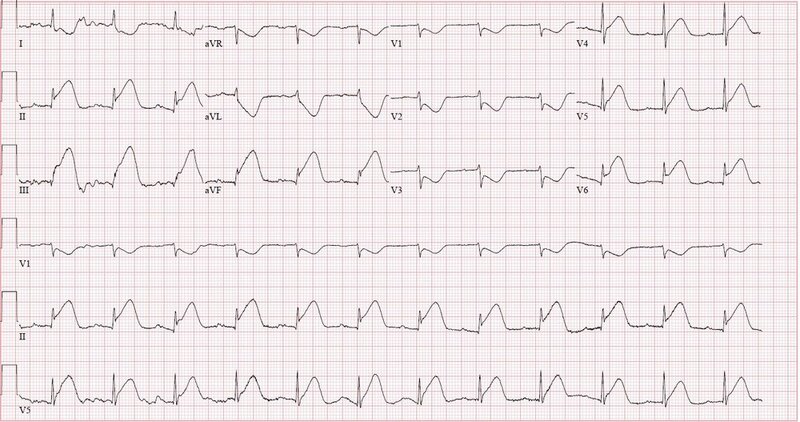 In addition, the findings of R waves with ST depressions in leads V1-V3 suggest posterior wall involvement. Remember that ST elevations are not 100% specific for MI and can be mimicked by other disease processes. This patient’s history was concerning for an aortic dissection. If a dissection extends backwards towards the coronary arteries and causes a coronary artery dissection, ST elevations can be manifested on EKG. The most common artery involved in a retrograde dissection is the Right Coronary Artery. This will usually cause ST elevations in the inferior leads. This patient had a bedside ultrasound which showed an aortic dissection flap with no pericardial tamponade. Below is a slice of the patient’s CT scan. It demonstrated an aortic dissection from the aortic root to the iliac bifurcation with occluded blood flow to the left iliac. The patient was taken to the OR. She was found to have a dissected ascending aorta with a dissected right coronary artery. Remember to pay attention to the history. It will clue you in to the diagnosis.